My obsession with visiting Paris began as soon as I found out we had gotten the rotation last July. In order to gain momentum and further advance my cause, I cleverly started brain-washing my 2-year old daughter starting our first week here. Now, now, it was perfectly harmless and let me paint you the picture: It’s our first month. Ice covers the ground. Our home is completely empty of furniture except for the few items which fit in the air-shipment (a couple card tables and four folding chairs) along with some new pieces acquired from Ikea. I’m completely new at this stay-at-home-mom gig and my daughter is used to being entertained for 9-hours a day at school in Texas with singing-time, nap-time, art-time, outside-time, etc. etc. etc. I’m struggling with trying to keep up with her energy while taking care of our 3-month old at the same time. We play. We read. We sing. We dance. I embrace Raffi and Peter, Paul, and Mary songs. I even learn to adore Elmo because he can entertain her for a solid 20 minutes so I can at least bathe once a day. We literally walk in circles around the house. I push the baby in the stroller and she pushes her tiny pink grocery cart pretty much every day for an hour. It’s too cold to go outside, and even if I wanted to go outside, my double stroller is on its way with the furniture, anyway. Everything is expected to arrive mid-February. During the subsequent months, as the movie played we talked about boats, fountains, lamp posts, people, rain, umbrellas, the “windmill” (Moulin Rouge), and after about the 20th repeat, we had The Eiffel Tower down. She recognized Paris as best as any 2-year old could. And I couldn’t wait to show her the town. The day before we are scheduled to depart, I start to panic. I’m pushing the double-stroller to the Kruidvat (a CVS equivalent). I am on a mission to purchase formula and food for the baby for the trip. Even though Paris is only a 2 ½ hour speed-train ride away, I doubt they have the same formula that we’ve been giving him. My daughter is screaming. She’s been screaming all day in the house. She was screaming in the store. She’s screaming during the 20-minute walk home and the people riding their bikes past us are eyeing us suspiciously. I ignore. I reason. I negotiate. I plead. I threaten. I beg. I finally give up. There’s nothing I can do. It’s just, one of those days for any 2-year old. I have visions of us in Paris with a screaming 2-year old and I’m worried and defeated and we haven’t even left yet. Do not schedule a train ride during your daughter’s nap time in hopes that she’ll fall asleep because of the rocking of the train. Nope, won’t happen. She’ll be so hyped up about the new environment (see LaQuinta, Big Spring comment above) to sleep. And will only result in craziness from your child and eyebrow raises from other train passengers around you. The rocking of the train, as a further note, is not as soothing and scary when traveling at speeds between 100 and 180 miles per hour. Flipkey.com is fantastic resource. We booked an apartment in Paris – complete with living room, kitchen, bath, and bedroom for less than the price of what we would have paid for a hotel. This is a great way to travel with kids/multiple adults, etc. The owners even provided us with a travel crib, baby gate, suggestions for restaurants in the area, etc. It was nice from a privacy standpoint as well. A sunny day in Paris = a line of a million people to ascend the Eiffel tower. No worries, though. If you’re not up to hours of waiting in line to see the city from a bird-eye perspective, there’s always the grassy knoll behind it. Beware of the short plastic gate around the grass. After a few priceless photos of your baby giggling uncontrollably with the most recognizable monument in the world behind him, you may be kicked out by French police, along with the other hundreds of people who innocently stepped over the fallen boundary. Paris food is completely awesome. As if I really needed to say that, but it really was easy to find a good meal, which is key when traveling, right? Around every corner you’ll find a pastry shop or sidewalk café. Chocolate croissants will ail any mood/sleepless night, and everyone, including my daughter seems to enjoy eating ‘outside’. Pull a stroller up to the table at a charming sidewalk cafe, and whoa-la! You’ve got an out-of-the-ordinary family meal. You are not allowed to picnic inside the grounds of Versailles. In their defense, it IS listed on the map. But in case you miss it, there are guides to point you in the error of your ways. They’ll firmly instruct you to leave the area and find a picnic spot outside the grounds, which is fine. The view is better from the grassy area, anyway. 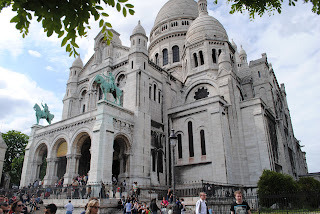 FTLOG - Find the tram up to the Sacré-Coeur. For those of you who may not know (I didn’t), the Sacré-Coeur is a lovely church ontop of the highest point in the City of Paris. It is a very long, steep climb, and while the memories of your husband stroller-racing a family of Spanish tourists up the 80-degree incline is priceless, at the time, you’ll be so winded, sweaty, angry, from carrying the other baby on your back to even care, much less, document the scene in digital format. There is a tram to lift you atop the mountain. I don’t know where it begins, but you bet your money, if we go back, we’ll find it. If life-long friend and elementary school teacher offers to accompany you and your family on a trip to Paris, take her up on it. I am incredibly fortunate to A. have a friend who I’ve known my entire life, just across the border from The Netherlands. As an Expat, this is rare and priceless. And B. The fact that she loves children (my children!) and comes equipped with phrases like, “You must hold my hand so we can be safe.” and hundreds of children’s songs downloaded onto her phone is amazing. She entertained my daughter while V and I toured the Versailles palace and hung back at the apartment while we had date night in Paris. I’m grateful and in awe. She rocks. Sometimes, a little wine and ‘cheese’ is all you need. We departed for ‘date night’ after hours of preparing the kids and ourselves for the event. One child would stop crying and the other would start. A romantic evening was hardly what I was in the mood for as we finally escaped the apartment and found ourselves high-tailing it to the nearest Metro to get across town in time for our reservation. After a quiet, tasty dinner, and a couple glasses of wine, my nerves had started to calm. We exited the restaurant and as we turned the corner we saw the Eiffel tower. I smiled and as I started to take photos, the clock struck 10 and the entire tower started to glitter. It was enchanting. 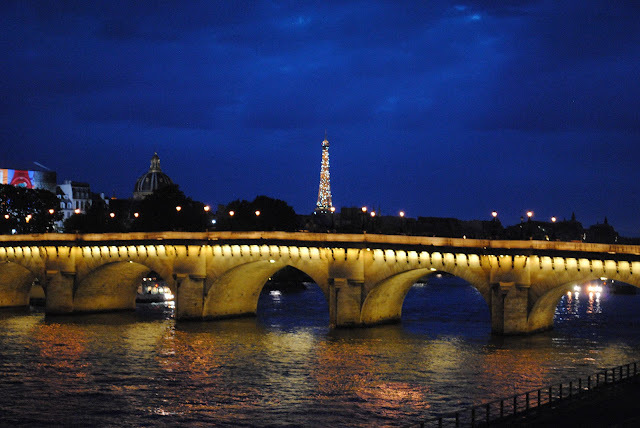 We continued to head towards it and as we crossed the Pont-Neuf Bridge, a familiar song started to play from my husband’s pocket. I laughed in recognition of the Midnight in Paris soundtrack, kissed him, called him a goofball and appreciated his efforts. It wasn’t the most ideally romantic visit to the City of Lights, but we did it in our style, despite the odds. Traveling by train period, with two small children, is probably not the best way to go. There is a mass construction project currently at the Rotterdam Station, where we must connect to the speed train to Paris. While the friendliest Dutch people in the country apparently work there (one officer took us through the super-secret freight elevator passage ways complete with James Bond theme songs and Billie Holliday elevator music playing on his phone. Another happily pushed the baby’s stroller throughout the station while instructing us how to find the elevators on our way back) it was just a little exhausting. We didn’t have to worry about Rotterdam on our way back, though. We hadn’t anticipated the quickness of the stop and once we completed loading the kids in their strollers, accumulating our luggage, and were about to step out of the train onto the platform, the doors shut closed. Not to be opened again despite my pounding and “NOOOOOOOOOOOOO!” like a bad movie. We rocketed past Leiden to the Amsterdam Schipol station only to turn around and take the train south again. It was not all bad, though - V did get some sympathetic Good Samaritan hands to help lift luggage or a stroller onto the train once he started carrying our daughter’s pink polka dot duffel bag around his shoulders. Get familiar and excited. Whatever form that may take, whether it be a movie or a Children’s video that introduced my daughter to the concept of going to museums and seeing The Thinker by Rodin and The Mona Lisa, reading a Hemingway novel, or just pursing through guidebooks, being able to see something relatable and recognizable was key to our success. Watching my daughter’s eyes light up with recognition upon seeing the Eiffel tower for the first time was one of the highlights of the trip. Even this morning, a week after our return, she ran up to me shouting “Thinker! Thinker!” as her children’s video showed cartoon rabbits tromping through a sculpture garden full of recognizable art. As for me, I’ll have to admit, I’m with Rachel McAdam’s character with her distaste of walking through the rain in Paris. 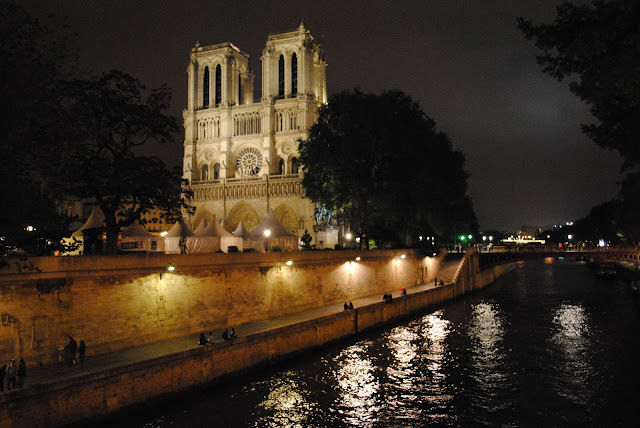 But I’ll agree with Owen Wilson’s character – Is Paris more beautiful by day or by night? I can’t decide. I can make a convincing argument for both! Now I just have to figure out how to get my daughter excited about our next family trip to Bruges. I’d like to say that my emotions are stronger than the weather. I’d like to say that my thankfulness for being in Europe, of all places, would overwhelmingly conquer any negative feelings of frustration or depression that might come from days on end of cold, cloudy, rainy weather. I’d like to say that the carrot I’ve been holding in front of my nose for almost a year now, the – it’s-never-going-to be-115-degrees-Fahrenheit-in-The-Netherlands-carrot, is pulling me through with a unblemished aura that rivals any Grace Kelly character. Sad to say, but alas, this is not the case. In my defense; however, I think I’ve done pretty dog-gone well for this Texas girl who is used to the sunshine and thought (previous to moving here, anyway) that anything under 70 degrees is cold. Armed with my 6 long-sleeved Old Navy t-shirts and 4 sweaters from American Eagle, my wardrobe is pretty lacking when is comes to the old Girl Scout motto – Be Prepared. Sure, I have suits, long sleeved blouses and funky fishnet hose that equipped me quite well in Corporate America, where we suffered ‘the elements’ from our parking garages to the elevator, but that hardly equipped me for being a stay-at-home mom who walks (or bikes) outside, everyday. I was completely deceived when I arrived here in January – all the Dutch stores had already started stocking their shelves with fun short-sleeved shirts and jeans in rainbow of colors. I thought, well, no time to buy winter clothes, now – spring will be here in just a few weeks, even the stores say so! You are at position A and you will become position B, after two or such years. Your friends are at position C, and will become position D, after two or such years. When you return, the likely factor is that you will naturally think that they are still C and they will think that you are A, but in reality, you are both B and D which may not, necessarily mesh. The second point he mentioned, was that him and his wife had lived in multiple international locations, throughout their long marriage. He had a story – where after 5 or 6 months, he was laying on the couch watching T.V., on a Saturday morning, in Switzerland. He was so beaten-down by everything – how to buy food, how to commute to work, where to buy whatever for his house. . . that he was just. Done. Depressed. Exhausted. Luckily, his wife snapped him out of his bad mood and made him get out of the house and climb a mountain or something and get to where the sun was shining. Who knows, but the message was clear. He was in the most beautiful country in the world but was still just. . . defeated. 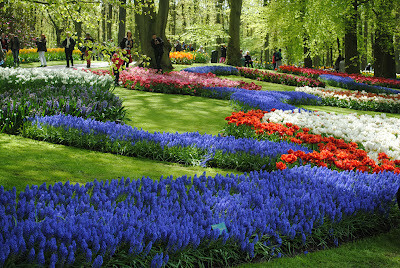 In all honesty, we had driven to Keukenhof Botanical Gardens a few weeks before, on my birthday. We had even parked and started to unload the strollers but as the grey skies loomed above us, and after the wind whipped around the car as V and I pretended to enjoy the simple cheese sandwiches I had prepared for our picnic, I had decided that there was no way. 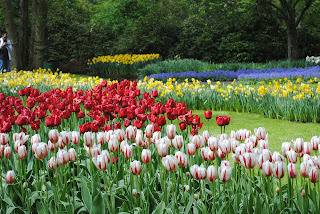 We had visited the Efteling theme park for our daughter’s 2nd birthday in the 30-such degree weather and had visited Madurodam (the miniature version of Amsterdam) in the pouring rain over Easter weekend, but no. 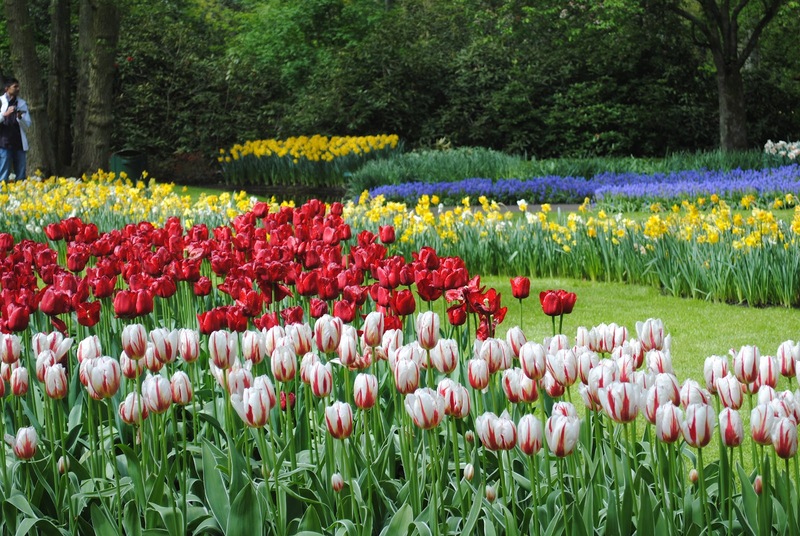 I was not going to spend the time or money to experience the most beautiful display of tulips in the freezing-cold weather. 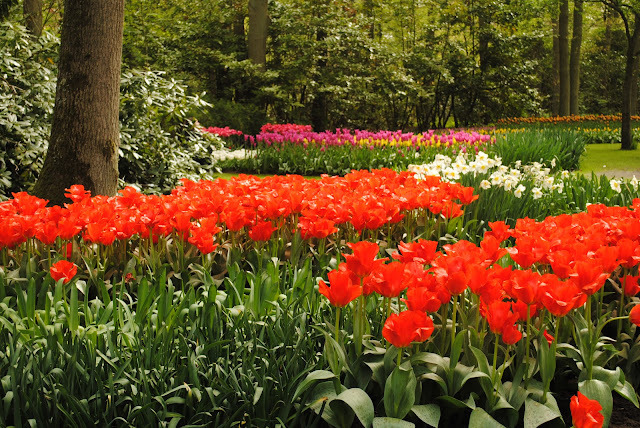 So we escaped like convicts, avoiding the parking fees, and found a tulip field nearby to take a few photos. Luckily, the wait paid off and Sunday turned out to be a gorgeous day. With anxious anticipation, we headed out to the Keukenhof and were not disappointed. Now, I’ve been fortunate to see quite a bit in my traveling days with AA and afterwards, but I have to tell you. 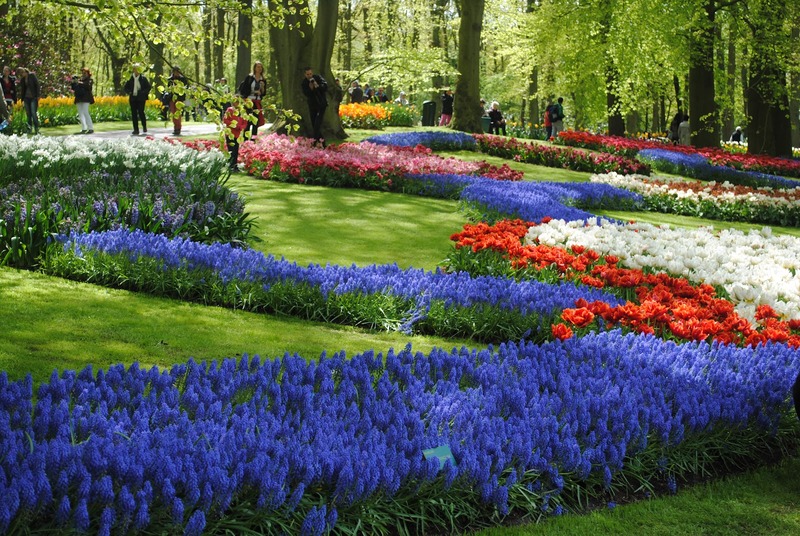 These gardens floored me. I was completely taken aback with a feeling I had not anticipated. Like the first time you see the Eiffel tower or the Christ the Redeemer statue in Brazil, it took my breath away at the absolute and unspeakable beauty and the effort that must have gone into creating such a fantastic masterpiece. The colors abounded. Just like watching Wizard of Oz for the first time in Technicolor, it was beautiful, peaceful, and extraordinary. 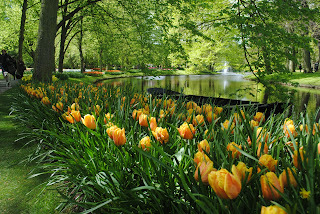 We wandered the gardens for hours, just taking in the artistic palate and scent of spring. Luckily, both of my children slept for a while in their strollers and to top it all off, they had a (very) random live Sesame Straat performance with Bert, Ernie, Elmo, and Pino (the purple Dutch version of Big Bird) on a small stage in the middle of the gardens. My daughter watched the performance with eyes as wide as saucers and didn’t even know what to do with herself when she met Bert and he put her on his lap for a photo op. UPDATE: As I’m proof reading this, a few weeks after I originally wrote it and with a trip to Paris between then and now, I realize that patience may be a virtue I can only hope to obtain during this 2-year rotation overseas. It’s been a gorgeous 70 degrees for three days in a row and while I’m still not completely convinced that it’s going to stay, a few days of short sleeves and sandals may be all I needed to get out of my funk. Now I just need to update my summer wardrobe. One of the natives who lives down the street already eyed my Old Navy flip flops suspiciously yesterday and asked if I had been to the beach. (Sigh). Why have I not driven a car in 4 months, or am not planning on driving a car any time soon? Do they drive on the left side of the road or something, you ask? No. They do not. They drive on the right side, so The Netherlands has that going for them. Is it the lack of stop signs, the traffic circles, the unlabeled streets, or the fact that you have to use the GPS everywhere you go? These are all valid points, but no. Go fish. Perhaps the reason I refuse to drive are all the one-way streets and mean Dutch policemen who will give you a verbal thrashing because you accidentally turned the wrong way down a one way street and as if you’re not already terrified that it happened in the first place, you need these two characters to accuse you of doing it on purpose (which, also begs the question – is going the wrong way down one-way streets a problem in this country???) You apologize repeatedly and it’s only after you’ve finally convinced them of your total stupidity, you must strategically complete a 17-point turn to put your car in the right direction without falling into the canal? You’re getting warmer, but no, not even that is the reason. The reason why I don’t drive is because of the bikes. 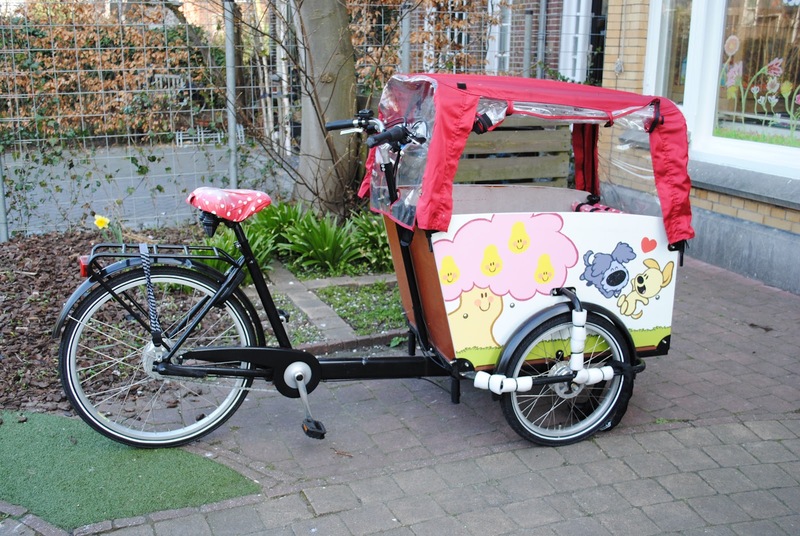 In The Netherlands, the bike (fiets – in Dutch) is the top of the food chain. Bikes have the right-of-way so all busses, cars, and even pedestrians must yield to the bike and everyone between the ages of 3 and 90 owns and rides a bike. Many people may own more than one. They will ride their normal bike to the train station in the morning, hop on the train, then have another commuter bike in the city they work. There are “fietspads” (bike paths) around the city that are similar to the bike trails in Plano or The Katy trail, but unlike Texas where the goal is simply aesthetics while you exercise, the fietspads purposely connect people in the city to the suburbs. 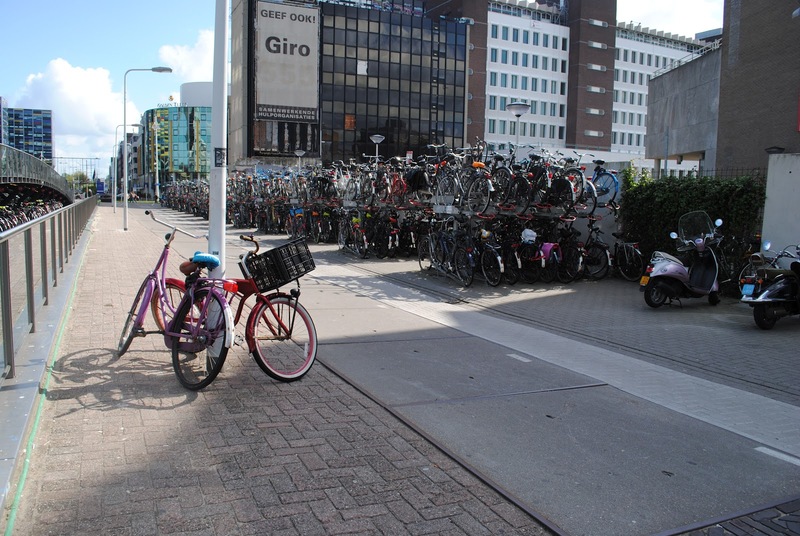 But fietspads are somewhat rare. On larger streets in town, there are individual bike lanes complete with a small median separating the bike lane from the traffic. These bike lanes even have their own traffic lights. On smaller streets, the bike lane is thin and separated by a not-so-protective dotted line. Driving down these streets with V, I could roll down the passenger window and touch handlebars. Consider a right hand turn in America – respectable brake, look left and right, and if clear, you go. Because bikes rein supreme, in The Netherlands, you pause, look left and right, but then look over your right shoulder at your blind spot and if there is a bike coming up behind you on your right that plans to go straight through an intersection, you have to pause and let them pass first. So, it’s a left, right, back, front head-turning process which is enough to make you dizzy and sick. So, instead of being the driver with the paranoia of hitting a bicycler with my car, I have become the bicycler. 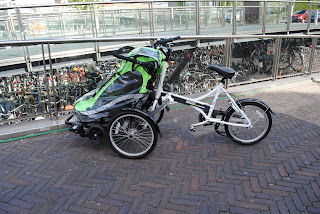 Biking around town with two small children – there is the canoe option, the death-defying-put-kids-on-the-handlebars-and-one-on-the-back option, or the-savvy-let’s-try-and-meet-in-the-middle-American-option. 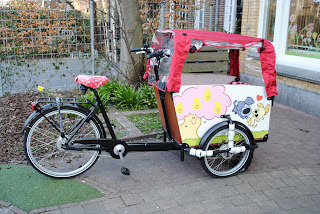 I picked the latter, and we found a used Zigo bike on Marktplaats (the Dutch version of Craigslist). My bike is similar to the trailers you’ve probably seen, but the trailer is in the front of the bike. 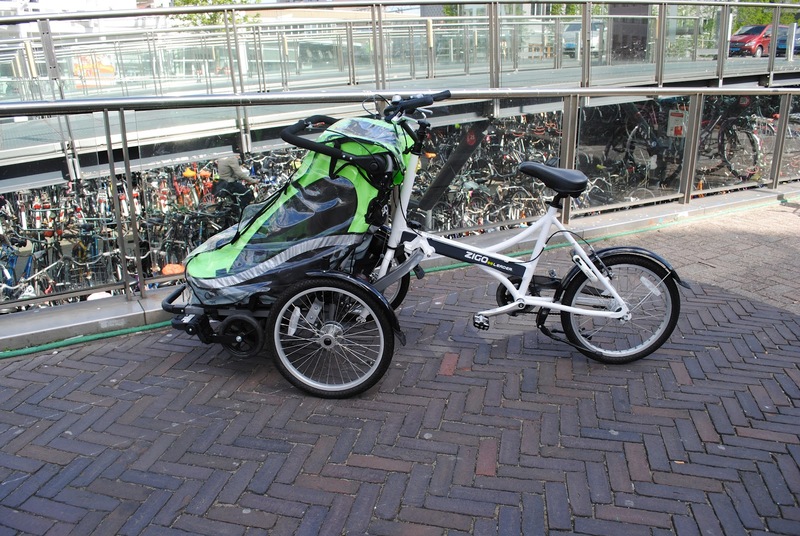 It’s also very handy because the trailer detaches from the bike and becomes a double-stroller. It's fun and I’ve gotten multiple compliments on and inquires as to where I got it, from many Dutch people. The kids are cozy, dry, warm, and relaxed, and I’m well, getting a heck of a workout and the only thing it’s lacking is a cup holder. We enrolled my daughter in an International preschool where they speak both English and Dutch to the children. The caveat was that it was on the other side of town – thus, the Zigo entered my life. We took it out for a spin, a practice run, if you will, a week before her enrollment date was set. Think of the first time you drove to your place of employment for your job interview. You’re nervous, you map the route out, and you drive with heated and intense anticipation and hope you get there in a reasonable amount of time. That’s me, on a bike. Using the suggestion of one of her teachers, we tried Breestraat through the center of town as our trial run. I’m in a constant state of panic because this road, although, most direct, doesn’t even have a bike lane – so I’m biking down this road with my neon green trailer, sharing the road with bikes, busses, and cars and before me, I see two delivery trucks, parked, in the middle of the road. I totally and completely FREAK OUT. My bike isn’t wide enough to go around the trucks, and instead of just parking behind it to wait it out and letting the normal sized bikes go around me and through the small space between the truck and the curb, I’m blocking the right part of the lane and apologetically chanting ‘sorry, sorry’ in my best Dutch accent while the bikes pile up behind me. I’m humiliated and my heart is racing and all the people behind me have no concept of the fact that I haven’t ridden a bike in twenty years. Or perhaps, it’s becoming apparent. Luckily, after the nerve-wrecking experience on Breestraat, I’ve found a more reasonable route around the town complete with bike lanes. Her school is held twice a week on Monday and Thursday mornings. Monday was a rather lovely morning and the sun was even shining. The temperature was cool, but not uncomfortable and as I pedaled closer to her school, the scent of spring filled the air. It was a surprisingly refreshing way to begin the week. Thursday, I was indoctrinated into true Dutch culture and had to ride my bike in the pouring down rain. My jeans became soaked, raindrops pelted my face and my daughter, who was cozy and dry inside the carrier, was excitedly chanting “umbrellas, umbrellas!” The rain slowly shifted from pouring buckets to a drizzle as I neared her school, and I couldn’t help but shake my head and laugh at craziness of the scene. As the mascara I had meticulously applied just an hour early streamed down my face, I felt an overwhelming sense of accomplishment after arriving safely and happily at her school. I think I’m going to really enjoy this mode of transportation, despite the drawbacks of weather, storage space, and physical exertion. But when in Rome, do as The Romans, right? At the very least, I’ll be burning off all the cheese and fresh bread I’ve been consuming. I’m the grounded buoy amongst a hazy, bobbing, throbbing sea of bright orange. I carefully weave the baby carriage through the crowd, and my 6-month old’s eyes are as wide as mine. A 6 ½ foot tall lion with a Dutch flag draped around him like a cape glides by us, accompanied by five skinny girls in skinny jeans with orange feathers and beads wrapped around their long necks. I spot another lion, sitting at the permanent wooden tables in the middle eating French fries. His headdress is sitting on the table though, in order to consume that favorite of Dutch snacks. Another gaggle of girls walk by and I continue to carefully maneuver around them. They wear blow up orange crowns on their heads and bright orange sunglasses on their faces. The excited, drunken, buzz of the crowd is deafening, and as if it couldn’t get any louder – the Intercity train from Amsterdam to The Hague whips through the station above our heads at lightning speed with a thunderous roar. Leiden Central Station is not one of its stops. I pass more male college students with their faces painted and a girl with an orange feather sticking straight up like a question mark from her head. The whole scene reminds me of a University of Tennessee tailgate crossed with a Dr. Seuss book. Once I have walked past the flower shop, the plethora of food vendors, the bookstore, I arrive at my destination: The Hema. From what I’ve gathered, Hema is similar to Target in the U.S. There is a larger Hema in town, but the train station version is quite interesting to me. I’m not sure how they decided what to put in the smaller version, but you can buy sliced ham, crayons, bras, birthday candles (unfortunately, I realized this a week too late for the 2-year old’s bday), print photos, hairclips, men’s underwear, stockings, bells for your bike, fresh(ish) sandwiches, notebooks, wine, amongst other seemingly random things. They do not sell hairdryers. I looked, my second day here. It was my first quest amongst many, many other things I would hunt down. I figured travelers need hairdryers? They’ve got underwear in case you pop up naked like Henry from The Time Traveler’s Wife, but alas, hairdryers didn’t make the list. But anyway, it is typically very convenient and only a five-minute walk from our house; however, on this particular day, at this particular moment, I completely misjudged my decision to just run to the train station with the baby to pick up a bottle of wine at 6:00 p.m. on Queen’s Day. Not only was the train station a vessel for transporting and feeding the masses after a day-long (or perhaps, for some, weekend long) revelry, celebrating life, liberty, and Heineken, but apparently a good place to pick up some last minute wine to end the evening, as the Hema was completely sold out. The scene was in stark contrast to the one just 8 hours earlier when we first passed through the train station on our way into town. The sun was shining brightly and strollers decorated with orange balloons abounded. There were a few younger people stumbling and squinting their way through the station, looking and pointing to the train headed towards Amsterdam. They slowly climbed the steps to the platform, gearing themselves up for another fun-filled day while taking cautious sips from paper cups filled with black coffee. Apparently, Queen’s Day Eve is an event in and of itself. My LSU-grad husband briefly reminisced about his frat-boy college days, particularly on the eve of big games like LSU-Florida, and looked at them with empathy as we pushed our two children past them and closer into town. When we arrived, the downtown area had been transformed. 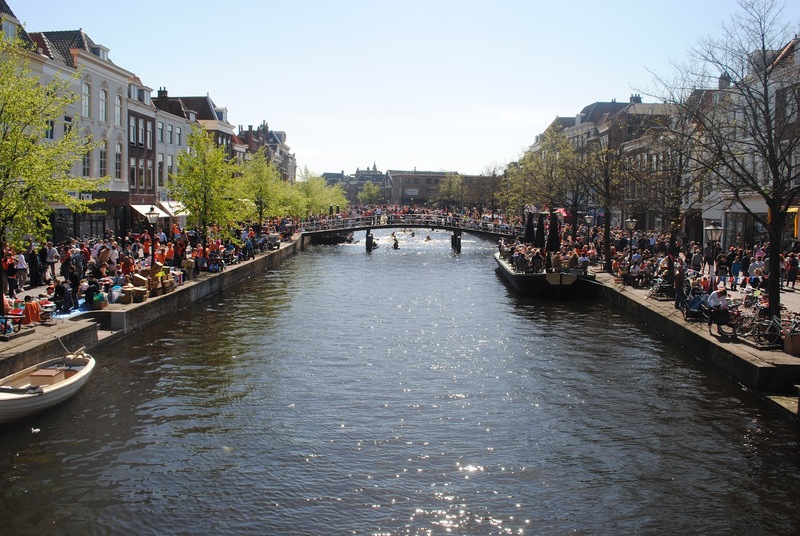 Thousands of people, strollers, food vendors and beer vendors had lined themselves along the canal. Everywhere we looked people had put blankets on the ground and were attempting to sell junk. Apparently, everyone in The Netherlands cleans out their closets the week before Queen’s Day, and brings their unwanted goods out to the middle of town and participates in a huge country-wide garage sale. Blankets were littered with puzzles, stuffed animals, used shoes, used clothes, glass vases, board games, children’s magazines, and small old TVs. We turned down a side street and stumbled upon more professional people attempting to sell higher end goods such as antiques, handmade jewelry, and reference books. These people had tables and awnings. I briefly admired an antique pepper grinder, but responsibly reminded myself that I already had one of those at home, and we continued weaving the children between the crowds of people down the brick street. It was the perfect day. It was a sunny, 68 degree day, which we hadn’t seen since we arrived in this country (and well, haven’t seen since). Everyone was excited to shed their winter coats, and even their ‘spring coats’ as the stores cleverly market them, enabling everyone to don the orange shirts, orange pants (in some cases), and orange accessories they’ve been saving and preparing for with the intensity of a beloved Halloween costume. We stood in awe and confusion for a good ten minutes on a street corner near the Town Hall, just taking in the scene. It’s quite an experience, attempting to participate in a country celebration when you are not from the country. Everyone in the crowd had been celebrating Queen’s Day since they were born. They knew what to expect from this day. Here we were, seeing it for the first time, in our early thirties with our two small children. We enjoyed it. We did. But it was a little overwhelming at the same time. Kind of like going to your first SEC tailgate after you’ve graduated from Baylor. It just takes a while to understand what to expect, and you feel really out of place until you do. We couldn’t understand what everyone was shouting or saying around us. Similar to explaining to SEC fans that alcohol wasn’t allowed on your Baylor campus on Gamedays. That’s fun. They tend to look at you like you just spoke Mandarin to them. But anyway, we parked the strollers in the shade of a tree outside the Town Hall where there was space to move around a bit and unfastened the 2-year old from her stroller. The canal in front of us had been covered with a large stage. An announcer was shouting loud instructions in Dutch and couples stood poised, ready to dance. The music started and the couples instantly started hopping back and forth. Their dance movements were so tiny. The crowd on the stage was thick, but not so thick to require mouse-like movements, especially in a country where personal space is not necessarily valued on a daily basis. I began to wonder if it was perhaps a dance-off, you know, last couple standing wins, and each of the couples was attempting to save their energy. But I couldn’t understand what the announcer was saying, so I knew I’d never really know what the heck was going on, and instead picked up my daughter in my arms and danced with her on the ancient cobblestones next to the canal. She laughed and giggled until she said “No Mama!” so I put her down, and she did her own groove to the music, to the delight of a few old Dutch women walking by. It was nearing her naptime and I contently used the excuse to head back towards home. That evening, after I trekked past the Hema an additional 100 yards to the Jumbo, where they were not completely out of wine (yet), V and I sat on our patio, sipping French wine and reflecting on the day. We survived, lived, and experienced something completely new and overwhelming, and how often were we able to do something like that back home? 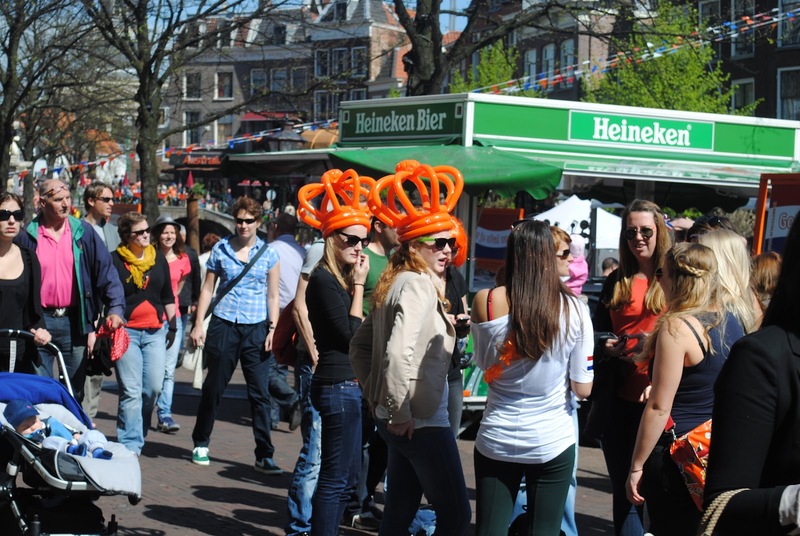 We decided that next year’s Queen’s Day – we’ll be ready. Perhaps we can find matching lion outfits for the kids.